The Marital Property Act extends beyond the split of assets and liabilities at divorce. Failure to know the Act's remedies and protections may expose a divorce client to liability or prevent collection of a debt that otherwise would be paid. No lawyer wants a client to pay thousands of dollars of debt that the client never knew existed, and no lawyer wants to ignore the potential that a client could collect on thousands of dollars of debt from a previously unknown source. But any family lawyer or creditor/debtor lawyer practicing in Wisconsin today faces those prospects. With credit card debt becoming increasingly common and increasingly high, it is incumbent on lawyers to properly understand all of the rules that affect and alter the liability their clients may face from the use of credit cards by the clients, or by a spouse or former spouse. That task is made more complicated by the interplay between the Marital Property Act (Wis. Stat. chapter 766) and the Family Code (Wis. Stat. chapter 767). The Marital Property Act (MPA) was created in 19831 and went into effect Jan. 1, 1986. A review of the purposes and history of the MPA is beyond the scope of this article. One goal of the MPA is to regulate relations between creditors and married persons (or formerly married persons). It sets up a procedure for classifying property into various categories and then determining who will control that property and when that property may be reached by creditors to pay debts. The MPA applies only to married or formerly married people and first applies on marriage or when a married couple moves to this state. The Family Code, chapter 767, applies when spouses file an action affecting the family - typically a divorce.2 Chapter 767 allows courts to divide property and obligations of spouses both before a divorce has occurred and during divorce proceedings. This article will help general practitioners, family law attorneys, and creditor/debtor counsel understand how chapters 766 and 767 interact, and then how to best use that interaction to effectively represent their clients in dividing responsibility for or collecting credit card debt. Handling credit card debt is not simple. Lawyers must know more about a debt than simply that it is credit card debt. How the debt came about and what the debt represents are significant pieces of information because they will allow a lawyer to determine how much, if any, of the client's property can be used to satisfy various debts. Briane F. Pagel Jr., U.W. 1988, is an associate at Krekeler Strother S.C., Madison, practicing family and consumer litigation. He also authored Sounding the Death Knell of Forced Consumer Arbitration, 79 Wis. Law. 12 (Dec. 2006), and has given seminars on the pitfalls of consumer collections and the doctrine of necessaries. Credit card accounts can be created and maintained in different ways. A card could be obtained and used by both spouses during the marriage, or could be obtained by both spouses but used by only one spouse, or obtained by one spouse but used by both spouses. Either spouse could act to obtain and use a card without the knowledge of the other spouse. Credit accounts can be used during the marriage for both business and personal reasons, to buy everything from office supplies to groceries to luxury vacations. To properly handle cases involving credit card debt, the lawyer must learn when the parties were married, who opened the account and when, and who used the account and when. This information will allow a lawyer to determine the parties to the account and who is the incurring or obligated spouse.3 The lawyer can then determine which statute categorizes the type of obligation, because the MPA has a general section for categorizing debts4 and a more specific section applying only to credit card accounts to which only one spouse is a party. The more-specific subsection makes different assets available to satisfy a debt depending on the date of marriage and date of opening the account,5 while the more general statute does not mention those factors. A careful lawyer also must determine the types of charges made on the account in order to classify the debt under the MPA - something that must be done whether or not the parties are still married. Classifying the debt means to fit it into one of the categories of marital obligations. Once the lawyer has obtained the information described above, the lawyer then can determine what property might be, or might have been, available to satisfy the debt during the marriage. Property available to satisfy debts under chapter 766 can be all marital property, a spouse's interest in marital property, or "other property of the incurring spouse. "11 Figure 1 and Figure 2 show what property is available under the MPA based on the varying factors. Categorizing the debt and the available property under the MPA are the first steps in determining how to allocate debt in a divorce decree or how to prosecute or defend a collection action against a divorced spouse. 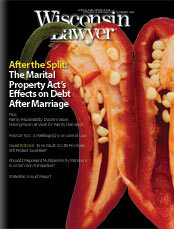 The lawyer next must analyze how the MPA will apply to that debt even after a divorce judgment. All marital property available to satisfy? Incurring spouse’s interest in marital property available to satisfy? Nonincurring spouse’s interest in marital property available to satisfy? Incurring spouse’s other property available to satisfy? Nonincurring spouse’s other property available to satisfy? Wis. Stat. section 766.55(2m) provides several avenues for continued application of creditors' remedies under the MPA. First, section 766.55(2m) allows formerly-marital property17 to be used to satisfy family purpose obligations even after the entry of a divorce judgment but only to the extent of the formerly-marital property's value as of the date of the divorce decree. Second, section 766.55 gives the divorce court the power to make income and separate property available after divorce to predivorce creditors that are owed family purpose debts. The section allows courts to order that income of a nonincurring spouse be available to satisfy family purpose marital obligations (but protects that income from creditors absent an order in the divorce decree). The section also allows the judge to make a nonincurring spouse responsible for satisfying an obligation - thereby transforming the nonincurring spouse into an incurring spouse and creating greater remedies for creditors (and, by making it more difficult to protect future assets, creating greater problems for debtors and divorce lawyers). Of the two avenues, the latter is a more formidable prospect. While it would be undesirable for a divorced spouse to have her income used to satisfy a debt her ex-spouse incurred during the marriage, it would be far worse for that spouse to have other property become available to creditors after divorce when that other property was not available during the marriage. For example, a bank account holding only money gifted to one spouse during a marriage would be the individual property of the giftee spouse and not available to marital creditors or subject to division at divorce. But a divorce decree ruling that the giftee spouse was responsible for the satisfaction of a credit card account could open up that separate account to creditors. It is not unheard of for courts to use their power to divide debts equally18 to order a party to pay some portion or all of a credit card debt even when the nonincurring spouse had no knowledge of the debt itself. Such orders then allow some or all of section 766.55(2m) to continue to apply after divorce. In several cases, divorce courts have ruled a nonincurring spouse was obligated to pay debt, thereby creating or altering liability under the MPA even after divorce. In Wilson v. Wilson19 the husband had obtained $29,000 in cash advances on credit cards, cash advances that were not adequately accounted for at the divorce trial. The parties owed approximately $65,000 in credit card debt and agreed that the wife did not know about the majority of the cards or their balances. The circuit court excluded the husband's credit card cash advances from the marital estate but ordered the wife to pay one-half of all credit card debt anyway. The Wisconsin Court of Appeals reversed and remanded for the purpose of determining whether the husband had actually accounted for the cash advances, but pointedly did not rule that the circuit court had erred in requiring the wife to be responsible for one-half of the debt. That ruling appeared to go unchallenged by any party. In Tabbert v. Tabbert,20 the circuit court ordered a husband to pay one-third of the wife's credit card and medical debts. The wife incurred the debts during the parties' four-year separation. In Wick v. Wick,21 the divorce judgment required the husband to pay credit card debts incurred before separation but without his knowledge or approval, because "at least some" of the debts were for family purposes. One factor to keep in mind is that a creditor is not necessarily bound by the divorce court's judgment. A creditor still might seek payment from either spouse, and although a creditor is not entitled to collect more than it is owed, the creditor need not keep track of who pays what amount. A client whose ex-spouse was obligated to pay a credit card debt, but who ended up paying the debt herself, would have to seek remedies against the ex-spouse, not the creditor. The rulings in the cases above made one or both spouses an incurring spouse. But the MPA can more drastically affect post-divorce liability by making a spouse an obligated spouse rather than an incurring spouse, which can have the effect of overcoming protections a divorce court thought it was granting. In St. Mary's Hospital Medical Center v. Brody,22 the creditor hospital obtained a judgment against the husband stemming from medical bills for care received seven months before the man was divorced, and the divorce judgment made the husband responsible for the debt. The hospital, undeterred, sued both ex-spouses after the divorce. The circuit court initially allowed the wife to be liable but attempted to limit the creditor to satisfying the judgment only to the extent of the value of marital property awarded to the wife in the divorce - an attempt by the circuit court to apply the protections of Wis. Stat. section 766.55(2m). The court of appeals reversed, finding the limitation invalid because the medical care was a necessity and therefore the MPA imposed on the wife the obligation to provide that necessity for her husband. This categorization meant that both spouses were obligated to pay the debt, a ruling that vastly expanded the creditor's reach by exposing "the widest range of [the debtor's] assets" to the creditor.23 The net result was that all of the wife's property was available to satisfy the debt, rather than a limited portion of formerly-marital property. The Brody case is an application of the "doctrine of necessaries," which also has been embodied in the statutes.24 A court ruling that something was a "necessary" can result in liability being imposed even if a divorce court declined to make a spouse liable on an obligation. Divorce lawyers and lawyers for creditors and debtors can use their understanding of the MPA and its effects after divorce to represent their clients. Divorce lawyers should analyze what debts exist and what category they fall into, what property a client is likely to be awarded, and the value placed on that property. When there are high levels of credit card debt, divorce lawyers can seek awards of property that are likely to diminish in value, because less property would be available to satisfy a debt following the divorce. Property that appreciates in value, and for which the value is easily determinable, might have the opposite effect. Divorce lawyers also should encourage clients to realistically value property. Clients who place a high value on property might find that higher value working against them in later litigation by allowing creditors a greater recovery. Divorce lawyers also should ensure that their clients do not unnecessarily place property at risk. A party with substantial individual and nondivisible property will not want to assume (or be required to assume) responsibility for family purpose debts. To determine how to proceed, lawyers also should make every effort to determine what debts actually exist by, for example, obtaining credit reports on their clients and asking opposing parties to provide a current report or a release to allow them to obtain one. If questions remain about whether all debts are known, consider seeking additional awards of property to compensate for the risk of having to pay undisclosed family purpose obligations.25 Although most marital settlement agreements provide that an incurring spouse who fails to disclose an obligation is solely responsible for that debt, that protection might be insufficient, because to the extent that the obligation was a family purpose obligation under Wis. Stat. section 766.55(2)(b), a creditor would be free to seek satisfaction from the formerly-marital property awarded to the nonincurring spouse under subsection (2m). Lawyers for creditors and debtors can discover additional assets available to satisfy debt by becoming more familiar with family court procedures and determinations. Information about what was awarded and how much it was worth, and who was determined to be responsible for an obligation, is available in the family court file. Lawyers should obtain a copy of the divorce decree and any incorporated marital settlement agreement, and any financial disclosure statements filed at the time of the final hearing, to find out what property was awarded and the value of the property. The judgment and incorporated agreement typically are public records available without any notice to the parties; however, financial disclosure statements are confidential by statute,26 so a lawyer will need to file a motion or obtain a release to get the necessary information. To ensure that their clients have the best chance of getting paid, creditors' lawyers also might want to intervene in the divorce to ask the circuit court to make income or property available to them. Such action is not unprecedented. A tort creditor, the victim of the husband's embezzlement, intervened in a divorce action in Curda-Derickson v. Derickson27 to ask the circuit court to classify the husband's restitution order as a marital debt. The circuit court ultimately denied the request, and the court of appeals upheld the ruling on the basis that tort debts, because they were an exception carved out in the statute, were by definition not "incurred in the interest of the family" and so could not be found to be family purpose debts under Wis. Stat. section 766.55(2)(b). It appears that the tort creditor in Curda-Derickson only asked the circuit court (and the court of appeals) to classify the debt as a family purpose debt under section 766.55(2)(b). The creditor might have prevailed had it requested, instead, that the circuit court "provide that the nonincurring spouse [be] responsible for the obligation" under the last sentence of section 766.55(2m), because that request would not require a court to reclassify a debt but only to determine who would pay a previously classified debt. Creditors owed an arguably family purpose debt might fare better intervening in divorce actions, easing the way for post-divorce collections (or getting a debt paid before the divorce is finalized). Divorce does not help the newly single debtor escape the reaches of the MPA, and the MPA's name belies the reach of that expansive law. Lawyers who represent family court litigants, creditors, or debtors need to be aware of the pull of the MPA, because a failure to know the remedies and protections provided might either needlessly expose a client to liability or prevent collection of a debt that otherwise would be paid. 1 1983 Wis. Act 186. 2 Spouses can file for legal separation, maintenance, or property division without necessarily filing for divorce. Wis. Stat. § 767.02. Obligated: To bind, compel, or constrain by a social, legal, or moral tie. The American Heritage® Dictionary of the English Language, 4th Ed., Aug. 15, 2007, from Dictionary.com, http://dictionary.reference.com/browse/incur. 4 Wis. Stat. § 766.55. 6 Wis. Stat. § 766.55(1). 7 Curda-Derickson v. Derickson, 2003 WI App 167, 266 Wis. 2d 453, 668 N.W.2d 736. 8 Wis. Stat. § 766.55(2)(a). 9 Wis. Stat. § 766.55(2)(c)1. 10 Wis. Stat. § 766.55(2)(cm). 11 Other property can include individual property or property that is unclassified by the MPA. Wis. Stat. section 766.31 is the classification statute under the MPA. 12 The determination date is the date on which chapter 766 first applies to spouses. See Wis. Stat. § 766.01(5). 13 Wis. Stat. section 766.555(2) applies to spouses for whom the determination date is 12:01 a.m. on Jan. 1, 1986 - generally meaning those people who were married and lived in Wisconsin before that date and went on living there after that date. January 1, 1986, is the date on which chapter 766 went into effect. 14 See Wis. Stat. § 766.555(2)(c). 15 Wis. Stat. section 766.555(3) applies to spouses whose determination date is something other than 12:01 a.m. on Jan. 1, 1986 - generally, couples who married after that date or married before that date but moved to Wisconsin after that date. 16 A family purpose obligation is one incurred by a spouse in the interest of the marriage or the family. See Wis. Stat. § 766.55(2)(b). 17 The MPA uses the phrase marital property, which technically is a misnomer because after a divorce decree is entered there is no "marital property." See Wis. Stat. § 766.03(2). 18 See Wis. Stat. § 767.61. 19 Wilson v. Wilson, No. 99-0673, 2000 WL 174961 (Wis. Ct. App. Feb. 16, 2000) (unpublished). 20 Tabbert v. Tabbert, No. 93-1525, 1994 WL 51928 (Wis. Ct. App. Feb. 23, 1994) (unpublished). 21 Wick v. Wick, No. 82-182, 1982 WL 171615 (Wis. Ct. App. Dec. 27, 1982) (unpublished). 22 St. Mary's Hosp. Med. Ctr. v. Brody, 186 Wis. 2d 100, 519 N.W.2d 706 (Ct. App. 1994). 24 Wis. Stat. §§ 765.001, 766.55(2)(a). 25 See Sleight v. Sleight, No. 03-2383-FT, 2004 WL 914424 (Wis. Ct. App. Apr. 20, 2004) (unpublished) (husband awarded unequal property division after court found that wife engaged in marital misconduct by secretly applying for cards in husband's name and by concealing accounts). 26 Wis. Stat. § 767.127(3)(a). 27 2003 WI App 167, 266 Wis. 2d 453, 668 N.W.2d 736. 28 See 12 C.F.R. §§ 226.7(b) (periodic statement),.25 (record retention). Enforcement agencies may require longer record retention periods. 29 See Jeffords v. Scott (Jeffords), 2001 WI App 6, 240 Wis. 2d 506, 624 N.W.2d 384 (divorce court properly amended divorce judgment following wife's discharge in bankruptcy of loan from husband, because amendment resulted in each party having same proportion of property division). 30 See Eckert v. Eckert, 144 Wis. 2d 770, 424 N.W.2d 759 (Ct. App. 1988). 31 In re Zick, 123 B.R. 825 (Bankr. E.D. Wis. 1990).